Stevens, a former blue collar road worker for the city, always displayed such appreciation for his small hometown while pursuing his life-long dream of becoming a country music star on The X Factor. Viewers were captivated by this unassuming Southern gentleman with the powerhouse vocals. Among those viewers was a contingent of Belton residents, who led the charge to raise 100% the funds for the water tower repainting and dedication. 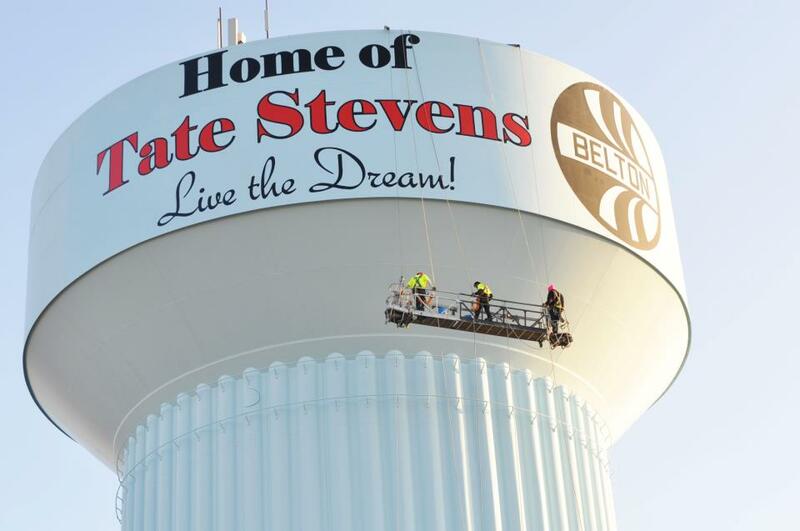 Belton officials unveiled the landmark, located near Stevens’ home off Interstate 49 and M-58 Highway on Sunday, March 31 with the formal dedication, which Stevens will attend, scheduled for Monday, April 22, with media call-time at 10:30a.m. CDT. Stevens will perform a sold out show in Kansas City, Mo. at the Midland by AMC on Sunday, but fans can still purchase a limited number of tickets to his Monday night performance here. 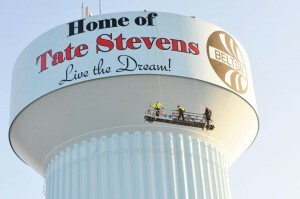 For a list of upcoming tour dates and latest happenings on Tate Stevens, visit www.tatestevensofficial.com.